Mulki, July 11, 2016: In a tragic road mishap, a pick-up vehicle driver drowned in a lake near Kenchanakere after his vehicle plunged into the lake on July 10, Sunday night. The deceased driver has been identified as Lakshmana Poojary. He was on way towards Pakshikere from Mulki on Sunday night to pick up a passenger who had hired his vehicle, when its steering suddenly broke off and the vehicle rammed against the embankment of the lake before plunging into the lake. Lakshman Poojary was a resident of Kapikad near Pakshikere. He had even called his home at 10.30 p.m but his mobile phone was found switched off later on. Locals spotted his vehicle in the lake on Monday morning and informed the police. 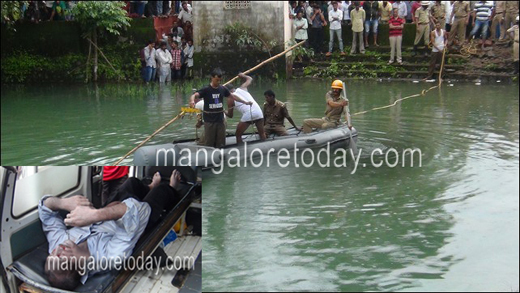 The vehicle was lifted from the lake and even Lakshman Poojary’s body was retrieved. Mulki Police have registered a case. Whom can we blame for such incidents?